Artist's illustration of NASA's life-hunting Mars 2020 rover on the Red Planet's surface. NASA's Curiosity Mars rover hasn't found signs of alien life, but one of its wheeled brethren just might do so a few short years from now. Yesterday (June 7), Curiosity mission scientists hit the world with an astrobiological one-two punch. 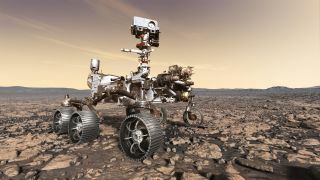 The rover, they announced, had spotted organic molecules in ancient Red Planet rocks and identified a seasonal cycle in the concentration of atmospheric methane, suggesting that the gas is leaking from underground reservoirs. In fact, Curiosity isn't equipped to hunt for life; its main goal is to determine if Mars has ever been capable of supporting microbes. The rover mission has achieved that goal, showing that its landing site, the floor of a huge crater called Gale, harbored a potentially habitable lake-and-stream system long ago. "ExoMars might even come across stuff that's significantly better preserved, [allowing it to] tease out some information on source," Eigenbrode, who led the newly published Curiosity organics-detection study, told Space.com. "Even in relatively low methane abundances, they should be able to get the carbon-13 ratio," Webster, a senior research fellow at NASA's Jet Propulsion Laboratory in Pasadena, California, told Space.com, referring to the ExoMars team. That ratio will be very interesting to astrobiologists, because biologically produced methane here on Earth is significantly depleted in carbon-13. The first phase of ExoMars launched the Trace Gas Orbiter (TGO) and a landing demonstrator called Schiaparelli toward the Red Planet in March 2016. Schiaparelli ended up crashing into the Martian surface, but TGO arrived safely and recently settled into its final orbit. The probe's measurements should allow researchers to make global maps of methane and other low-abundance gases in Mars' air, ESA officials have said. These maps could help guide future life-hunting surface craft to promising locales, Webster said. "The big question is, will they see plumes or patches or spikes?" Webster said. "If they could tell us there's a region of Mars where the methane seems to be coming from, that would be huge. Now we can direct future missions in that direction." Nobody knows, of course, whether microbes or any other organisms have ever called Mars home. But Curiosity's discoveries are cause for some optimism in this regard, NASA officials said. "With these new findings, Mars is telling us to stay the course and keep searching for evidence of life," Thomas Zurbuchen, associate administrator for the Science Mission Directorate at NASA headquarters in Washington, D.C., said in a statement. "I'm confident that our ongoing and planned missions will unlock even more breathtaking discoveries on the Red Planet." Follow Mike Wall on Twitter @michaeldwall and Google+. Follow us @Spacedotcom, Facebook orGoogle+. Originally published on Space.com.